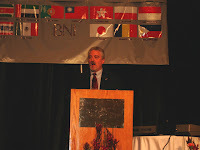 Refer from our CEO BNI, Mr Norm Dominguez . End of Year 2007 Chapter Count: 5,010 chapters, 103,607 members and 20.7 members per chapter. In addition to Norm’s announcement below, here are the official year-end BNI referrals and dollar value for 2007: Total Referrals: 5.5 million, Dollar value: 2.2 Billion (USD)!!! BNI Malaysia member was visited to BNI-Indonesia Oasis. 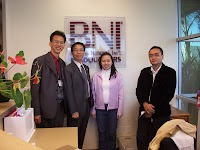 Mr. Vernon, ( Right standing next to Mr Hari Purnomo) BNI Malaysia member was visited BNI-Indonesia Oasis leaders team. They were shared information and made strategic plan in 2008. Set up goal Number of Referral, done deal and visitor. Batam August 22, 2007 , Mr Hari Purnomo National Director of BNI-Indonesia, Mr Mervin Yeo National Director of BNI Singapore and Mr Andi M Lutfi As Director of Sumatra Promotion Centre Ltd, made collabration to conduct BNI Infosession in Batam.